Tecplot announced the release of Tecplot 360 EX with new technology they call SZL which promises 92% less memory usage and a 9.6x speed-up over previous versions. In addition, the software’s UI has been redone using Qt. Yves-Marie Lefebvre has been named FieldView Product Chief. The company is working on EPISODE, a new tool for managing multitudinous large datasets. Best of the visualization web for May 2014. Sandia’s S3D direct numerical simulation software imposes serious challenges on postprocessing. Mr. Wong is on a roll: here he writes about why CAD interoperability remains a problem. 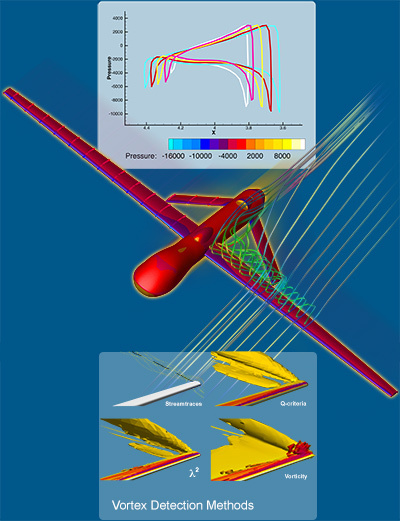 Composite image of CFD visualization from Tecplot 360 EX. Image from Tecplot. Simscale has open positions for computer scientists and mechanical engineers. Flow Science was one of 10 firms awarded a grant from the Venture Acceleration Fund. If you use the DAFUL multi-body dynamics software you might be interested in use of EnSight to visualize its results. CFD helps design a new dredge ball joint. CFD considers whether natural ventilation is sufficient to maintain comfort inside a building. ESI announced the agenda for day 1 of 3 for their 2nd OpenFOAM User Conference 2014. TheFDS-SMV (Fire Dynamics Simulator &Smokeview Visualizer) developers have a two questions for their users. What’s the future of parallel processing using MPI? Example of the use of simulation to design offshore platforms. Image from International Science Grid This Week. Click image for article. From the GPU Technology Conference 2014 comes this keynote demonstration of simultaneous physics simulation and graphics processing, some in real-time. Prof. Lorena Barba spoke on computational thinking and learning at SciPy 2014. Caterpillar, Argonne National Lab, and Convergent Science are collaborating on computational simulation of diesel engine performance and emissions. Via this tweet (with image) we see that mesh generation is coming to Mathematica 10. ANSYS shared their thoughts on the ROI of CFD. MSC Software’s Aerospace and Defense Industry User Meeting will be held 17 Sep 2014 in Newport Beach, CA. Femap v11.1.2 is now available. Beta CAE released ANSA v15.1.1. There’s a new version of Mesh2Surface for Rhino. CD-adapco announced the release of STAR-CD v4.22 with improved physical modeling and preprocessing. We know how music sounds. But what does it look like? When Texas A&M’s Prof. Tim Davis isn’t developing algorithms and programs used in MATLAB and Google Street View he develops algorithms involving force-directed graph visualization and other technologies to convert sound into sight. Here’s New Order’s Blue Monday visualized with each note as a line and each tone as a color. For more examples of Prof. Davis’ work and details about how it’s done visit his website at notesartstudio.com. New Order’s Blue Monday is visualized in mesh-like form by Texas A&M computer science professor Tim Davis. Image from notesartstudio.com with permission. Bonus: Download and print your own jet engine! This entry was posted in Applications, Events, Hardware, News, Software and tagged ANSYS, CD-adapco, Convergent Science, DAFUL, EnSight, ESI, FDS, Femap, FIeldView, Flow Science, Intelligent Light, jobs, Mathematica, mesh generation, Mesh2Surface, MPI, MSC, NVIDIA, OpenFOAM, Rhino, S3D, STAR-CD, Tecplot, visualization. Bookmark the permalink. Don’t know what month this article is from but the comment will be the same about the cloud. I simply do not trust the cloud. For so many reasons. First security. There is no real security on the cloud, period. Second, financial distress and you lose your data, not being able to pay for its retrieval. Third, the courts. Any judge can block you from your technical data without leaving you any way to access your data. Fourth, think bankruptcy, lawsuit, patent infringement, and so many other possibilities. So, fee for service is the operable method, how high, how fixed are the rates. Then there is the stability of the cloud. Suppose the operator goes out of business, who can then have access to your data. Probably not you. I’ll still take a CD, or the like, for permanent storage over which I’ll have total control.